Welcome! As a new patient, we request that you arrive 10-15 minutes prior to your appointment time so we may complete the necessary paperwork. 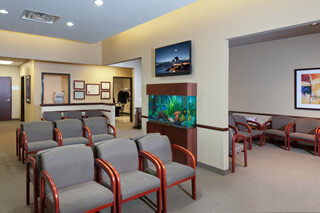 On your first visit to our office you will receive a comprehensive eye examination. It is necessary for you to bring your current eyeglasses and/or contact lenses for this exam. The initial work-up is performed by an ophthalmic technician and consists of a review of your medical history along with tests required to collect information about your eyes. A glaucoma check is routinely performed. Your pupils will be dilated during the initial work-up. It generally takes 20-40 minutes for the dilating drops to take effect. For some people, the use of these drops results in a lessened ability to focus and may increase your sensitivity to light for a short period of time. For this reason, you may want to arrange for transportation following your examination. Our office provides disposable sunglasses for your convenience, but we encourage you to bring your own if you have them. Following the work-up, you will be seen by the doctor for a more extensive evaluation. The complete examination usually takes approximately two hours. Please allow this amount of time on the day of your scheduled appointment. In order for your visit to be more pleasant and efficient, please print out and compete the patient information packet below. Please bring these completed forms, a list of your current medications, photo identification, and your insurance cards with you to your first visit. It is our office policy to collect payment at the time of service. If you have any questions, please contact our office at 972-296-2020. Our staff will be happy to discuss payment and financing options. Many patients are happy to discover that a vision correction procedure is an affordable alternative when compared to the ongoing cost and effort of glasses and contacts. If you are covered by insurance, please bring your current insurance cards with you to your exam so we can help you receive any insurance benefits for which you may be eligible. Qualified expenses may be paid with funds from a Flexible Spending Account (FSA) or Health Savings Account (HSA). Using pre-tax dollars in these accounts can save patients up to 40%. Low-interest extended payment plans are offered by an outside company. We’ll work with you to set up a payment plan that fits your budget. The approval process is quick, easy and private. To apply, click here. It is a surgical procedure that changes the shape of the cornea–the surface of the eye — to improve vision. LASIK and PRK are two types of laser vision correction. They both use a cool beam of light (laser), controlled by a computer, to gently reshape the cornea to enable images to focus more clearly onto the retina to achieve better vision. The laser is approved by the FDA as a proven, safe and effective device to treat nearsightedness, farsightedness and astigmatism. You have nearsightedness, farsightedness, or astigmatism. You are unhappy wearing glasses or contact lenses and have a strong desire to eliminate or reduce your need for them. You are over 21 years of age. If you are under 21 years of age, your nearsightedness is probably still increasing. You understand or will take the time and effort to understand the risks associated with laser vision correction. Someone who insists upon a perfect correction might not be a good candidate due to having unrealistic expectations. A perfect correction is possible but cannot be guaranteed. If you are a woman, you are not experiencing hormonal changes due to pregnancy or breast-feeding. Hormonal changes will often cause temporary changes in your nearsightedness. Your suitability for refractive surgery, and the best technique for your individual case, can best be determined through a personal consultation and examination of your eyes. We provide an extensive Pre-LASIK Consultation to determine if you are a good candidate for refractive surgery, and to discuss the option suitable for you. With LASIK, will I be able to completely eliminate my glasses and contacts? Over 99% of patients have 20/40 or better vision without glasses or contacts after LASIK (which is good enough to pass the driver’s license test) and 96% have 20/20 or better vision without glasses or contacts. I have been told I have astigmatism. Does LASIK correct astigmatism? Astigmatism occurs when the eye is shaped with some irregularity, like an egg. Astigmatism blurs the vision at both distance and near. Most people who have nearsightedness or farsightedness also have astigmatism, and laser vision correction is routinely used to correct astigmatism as well as the other problems. Can LASIK correct my reading vision? LASIK alters the shape of the cornea, which is the clear tissue in the very front of the eye. The need for reading glasses that comes as we get older (known as presbyopia) is a result of the aging of the lens deep inside the eye, behind the colored part of the eye. So LASIK does not correct presbyopia directly. However, if you have been diagnosed with cataracts or believe you may have cataracts, you may be a candidate for cataract surgery. During cataract surgery, your clouded lens is removed and replaced with an intraocular lens implanted in the eye. Currently, if you are undergoing cataract surgery, you have the option of choosing advanced technology intraocular lenses (multifocal IOLs) that are designed to achieve clear vision at far, near and intermediate distances, often with little or no need for glasses. These lenses address and correct nearsightedness, farsigthtedness, astigmatism and presbyopia. A consultation and examination will help us determine the best options for correcting your vision. I believe I have cataracts or have been diagnosed with cataracts. Is surgery the only treatment? Cataracts is a clouding of the eye’s natural lens. This condition most often occurs naturally as people age. When cataracts first develop, common symptoms of blurry vision or glare or halos from bright lights may appear. You may be able to use stronger glasses or contacts, magnifying glass, or better lighting to see better for a while. Surgery is indicated when cataracts have progressed enough to seriously impair your vision and affect your daily life. Cataract surgery is a routine and safe procedure to restore your vision. During cataract surgery, the surgeon removes the clouded lens and replaces it with a clear, synethic intraocular lens, commonly referred to as an IOL. Many patients now have the option of choosing a standard IOL or an advanced technology IOL. A standard IOL corrects either the patient’s far or near vision but not both. For instance, a standard IOL enables the patient to see well far away but the patient will still need to wear glasses for close-up tasks such as reading. An advanced technology IOL can potentially achieve a better visual outcome for a patient, depending on the patient’s needs. Two common types of advanced technology IOLs are multifocal IOLs and astigmatism-correcting IOLs. The ACRYSOFT IQ RESTOR© multifocal IOL is designed restore a full range of vision by addressing, in addition to the cataract, nearsightedness, farsightedness and presbyopia at the same time. The ACRYSOFT IQ TORIC© IOL is designed to correct a patient’s astigmatism, in addition to the cataract, to bring about sharper and clearer distance vision for a patient, but does not address presbyopia. The goal of cataract surgery is to restore the vision loss caused by the cataract. Depending on the patient’s need for correction and whether other eye conditions are present, a patient may have choices in the IOL used to achieve an optimal visual outcome for the patient. A complete eye exam will determine the best course of treatment and the options available for each patient’s particular case. The bottom line is, whereas many people believe poor vision is an inevitable part of aging; but cataract surgery is a routine, safe to regain good vision.